15 “Therefore watch yourselves very carefully. Since you saw no form on the day that the Lord spoke to you at Horeb out of the midst of the fire, 16 beware lest you act corruptly by making a carved image for yourselves, in the form of any figure, the likeness of male or female, 17 the likeness of any animal that is on the earth, the likeness of any winged bird that flies in the air, 18 the likeness of anything that creeps on the ground, the likeness of any fish that is in the water under the earth. 19 And beware lest you raise your eyes to heaven, and when you see the sun and the moon and the stars, all the host of heaven, you be drawn away and bow down to them and serve them, things that the Lord your God has allotted to all the peoples under the whole heaven. 20 But the Lord has taken you and brought you out of the iron furnace, out of Egypt, to be a people of his own inheritance, as you are this day. 21 Furthermore, the Lord was angry with me because of you, and he swore that I should not cross the Jordan, and that I should not enter the good land that the Lord your God is giving you for an inheritance. 22 For I must die in this land; I must not go over the Jordan. But you shall go over and take possession of that good land. 23 Take care, lest you forget the covenant of the Lord your God, which he made with you, and make a carved image, the form of anything that the Lord your God has forbidden you. 24 For the Lord your God is a consuming fire, a jealous God. 15Take ye therefore good heed unto yourselves; for ye saw no manner of similitude on the day that the LORD spake unto you in Horeb out of the midst of the fire:16Lest ye corrupt yourselves, and make you a graven image, the similitude of any figure, the likeness of male or female,17The likeness of any beast that is on the earth, the likeness of any winged fowl that flieth in the air,18The likeness of any thing that creepeth on the ground, the likeness of any fish that is in the waters beneath the earth:19And lest thou lift up thine eyes unto heaven, and when thou seest the sun, and the moon, and the stars, even all the host of heaven, shouldest be driven to worship them, and serve them, which the LORD thy God hath divided unto all nations under the whole heaven.20But the LORD hath taken you, and brought you forth out of the iron furnace, even out of Egypt, to be unto him a people of inheritance, as ye are this day.21Furthermore the LORD was angry with me for your sakes, and sware that I should not go over Jordan, and that I should not go in unto that good land, which the LORD thy God giveth thee for an inheritance:22But I must die in this land, I must not go over Jordan: but ye shall go over, and possess that good land.23Take heed unto yourselves, lest ye forget the covenant of the LORD your God, which he made with you, and make you a graven image, or the likeness of any thing, which the LORD thy God hath forbidden thee.24For the LORD thy God is a consuming fire, even a jealous God.25When thou shalt beget children, and children's children, and ye shall have remained long in the land, and shall corrupt yourselves, and make a graven image, or the likeness of any thing, and shall do evil in the sight of the LORD thy God, to provoke him to anger:26I call heaven and earth to witness against you this day, that ye shall soon utterly perish from off the land whereunto ye go over Jordan to possess it; ye shall not prolong your days upon it, but shall utterly be destroyed.27And the LORD shall scatter you among the nations, and ye shall be left few in number among the heathen, whither the LORD shall lead you.28And there ye shall serve gods, the work of men's hands, wood and stone, which neither see, nor hear, nor eat, nor smell.29But if from thence thou shalt seek the LORD thy God, thou shalt find him, if thou seek him with all thy heart and with all thy soul.30When thou art in tribulation, and all these things are come upon thee, even in the latter days, if thou turn to the LORD thy God, and shalt be obedient unto his voice;31(For the LORD thy God is a merciful God;) he will not forsake thee, neither destroy thee, nor forget the covenant of thy fathers which he sware unto them.32For ask now of the days that are past, which were before thee, since the day that God created man upon the earth, and ask from the one side of heaven unto the other, whether there hath been any such thing as this great thing is, or hath been heard like it?33Did ever people hear the voice of God speaking out of the midst of the fire, as thou hast heard, and live?34Or hath God assayed to go and take him a nation from the midst of another nation, by temptations, by signs, and by wonders, and by war, and by a mighty hand, and by a stretched out arm, and by great terrors, according to all that the LORD your God did for you in Egypt before your eyes?35Unto thee it was showed, that thou mightest know that the LORD he is God; there is none else beside him.36Out of heaven he made thee to hear his voice, that he might instruct thee: and upon earth he showed thee his great fire; and thou heardest his words out of the midst of the fire.37And because he loved thy fathers, therefore he chose their seed after them, and brought thee out in his sight with his mighty power out of Egypt;38To drive out nations from before thee greater and mightier than thou art, to bring thee in, to give thee their land for an inheritance, as it is this day.39Know therefore this day, and consider it in thine heart, that the LORD he is God in heaven above, and upon the earth beneath: there is none else.40Thou shalt keep therefore his statutes, and his commandments, which I command thee this day, that it may go well with thee, and with thy children after thee, and that thou mayest prolong thy days upon the earth, which the LORD thy God giveth thee, for ever.41Then Moses severed three cities on this side Jordan toward the sun rising;42That the slayer might flee thither, which should kill his neighbour unawares, and hated him not in times past; and that fleeing unto one of these cities he might live:43Namely, Bezer in the wilderness, in the plain country, of the Reubenites; and Ramoth in Gilead, of the Gadites; and Golan in Bashan, of the Manassites.44And this is the law which Moses set before the children of Israel:45These are the testimonies, and the statutes, and the judgments, which Moses spake unto the children of Israel, after they came forth out of Egypt,46On this side Jordan, in the valley over against Bethpeor, in the land of Sihon king of the Amorites, who dwelt at Heshbon, whom Moses and the children of Israel smote, after they were come forth out of Egypt:47And they possessed his land, and the land of Og king of Bashan, two kings of the Amorites, which were on this side Jordan toward the sun rising;48From Aroer, which is by the bank of the river Arnon, even unto mount Sion, which is Hermon,49And all the plain on this side Jordan eastward, even unto the sea of the plain, under the springs of Pisgah. What idols have you worshipped? 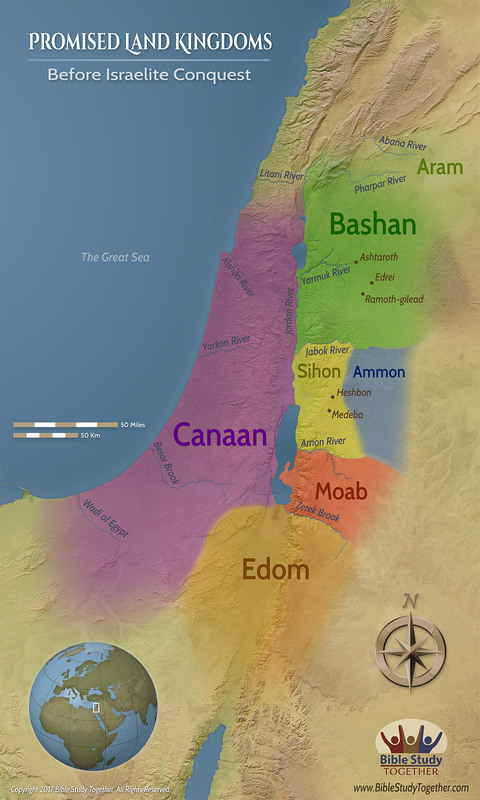 How did God show the Israelites that He chose them to be His people? What is the difference between the fruit of obeying righteousness versus obeying sin? Talk with someone about what it means to be a slave of sin.